If you're like me, you like to change accessories in your kitchen from time to time. With the right tools, making your own accessories can be lots of fun. When I was offered the opportunity to try a couple of new products available at Michael's stores, Folk Art Multi-Surface Paint and Handmade Charlotte Stencils, I jumped at the chance. I love fresh flowers, and I like to have a variety of holders for them, so I created an embellished vase. I was so pleased with the way it turned out, I think I'll make some more for gifts! Crafting with stencils is as easy as 1-2-3. 1. 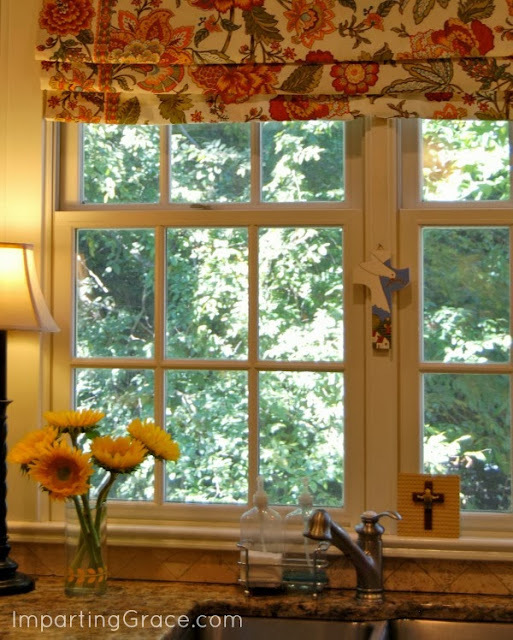 Choose a surface to embellish with a stenciled design. Clean the surface thoroughly. For the vase, I washed the glass, then cleaned it off with an alcohol wipe. 2. 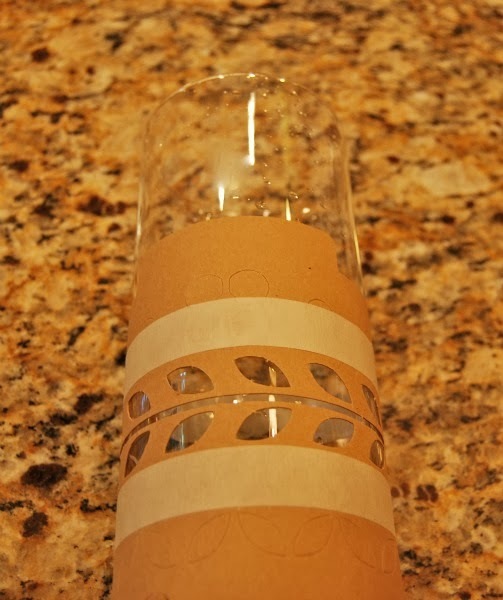 Choose the design you want to use, and tape it firmly to your surface with masking tape. As you can see, these stencils bend easily to conform to any surface. You must simply smooth it out completely and tape it very securely in place. 3. With just a little paint on your brush (I used a sponge (I used a sponge pouncer, or "Spouncer") to daub paint onto the stencil surface, one light layer at a time, until you achieve the look you want, then carefully lift the stencil straight away from your surface. 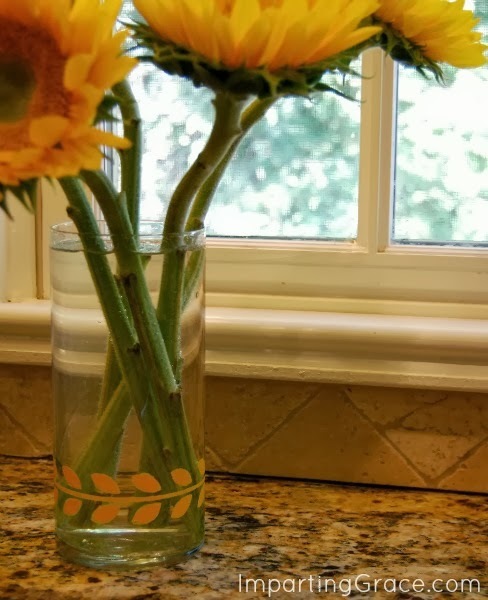 Doesn't the vase of sunflowers look cheerful in my kitchen window? These Handmade Charlotte Stencils are fun, affordable, and amazingly versatile. The stencils are made from heavy-duty but pliable cardstock. Each package contains a set of stencils--there were 71 different patterns in the kitchen set that I chose! And this Folk Art Multi-Surface Paint is the bomb. 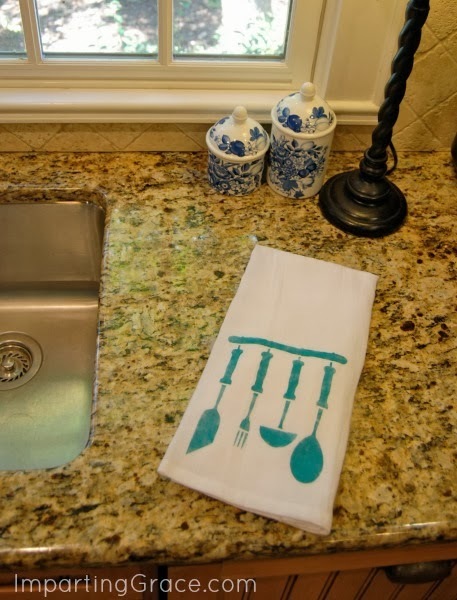 You can use it on just about any surface, and it's machine-washable and dishwasher-safe. I was a little skeptical about using it on glass, but as you can see from the vase, it adhered with no problem. 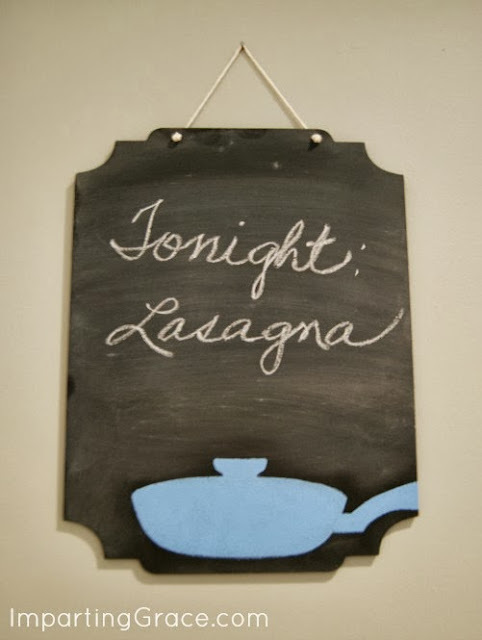 Once I got going, I kept thinking of other things I could make for my kitchen--and I was curious to see how the paint would do on a variety of surfaces. How about a dish towel? You bet! This paint is machine-washable. I think I'll put this design on a plain apron, too. Wouldn't that be cute? I even added a little pizzazz to my ugly old recipe binder. I wasn't sure if this would work, but the paint adhered beautifully to this plastic surface. 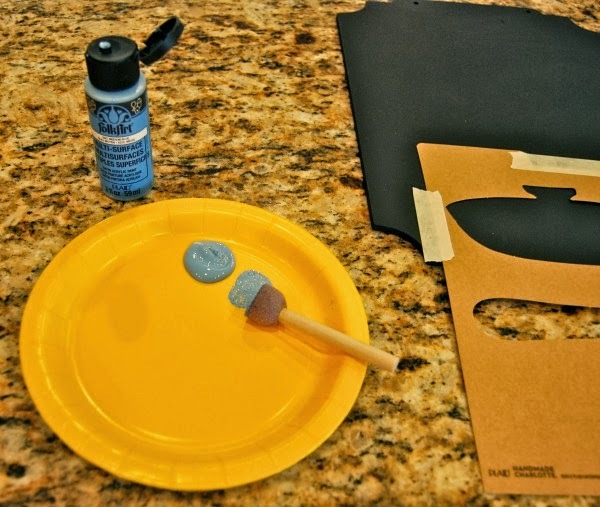 Use a paper plate as a disposable paint palette. It's important not to have too much paint on your brush when you're stenciling. I like to dip my brush in the paint, then remove most of the paint from the brush by daubing it onto a dry area of the paper plate. Then I daub the paint onto the stencil surface a thin layer at a time. With these Handmade Charlotte stencils, you'll have to punch out the cardstock designs yourself. This was really the only drawback I found to these stencils--you have to be sure to punch the designs out completely and to smooth down any edges that might be a little rough. I found that this small drawback led to a great advantage, though--you can use the design you punched out as a guide for stencil placement. Simply move the cardstock design around on your surface until you've got it just where you want it, then place the stencil right in that spot, remove the punched out design, and go to town with your paint! Want to get started on your own project? Now's a good time! Enter to win a $100 Michaels gift card and $100 worth of Folk Art Multi-Surface Paint in the Facebook contest being held now through September 30! Visit the contest here to get entered. This post was sponsored by Plaid with the Blueprint Social. All opinions are entirely my own. I love them! I have a black ceramic cannister set that I was going to get rid of because they disappear on my black countertops. By adding a border around them would be a perfect way to make them pop! I was going to Michael's on Friday...hmmm...maybe I will check them out! 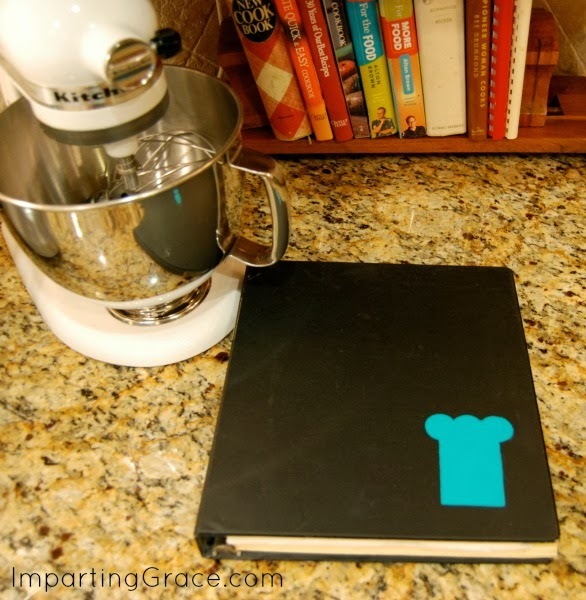 Your little vase and the kitchen towel are so cute, Richella! Richella those all turned out so good!! The glass container is cute but I love the towel you stenciled. I love all the items you shared here...especially the dish towel. Thanks so much for sharing! The stencil projects all turned out great! Those projects are so cute and easy to do!